When you're as lazy as I am, an in-shower moisturiser can be a complete godsend. I always spend ages in the shower so when I'm finished I like to get dried off & dressed as soon as possible. Moisturising my body just never comes to mind when I've got a million other things to be getting on with. I am prone to patches of eczema though so it is quite important for me to keep my skin hydrated. That's why I prefer getting my moisturising done while I'm still in the bathroom. Luckily there are quite a few products out there now that can get the job done quick sticks. If you're looking for a multi-purpose shower product you won't find anything better than L'Occitane's utterly gorgeous Almond Shower Oil. This does it all & smells amazing to boot! That beautiful almond scent lingers on the skin for hours. It works as a shower gel & body moisturiser in one so this is the best one to use if you're short on time. Despite being an oil it lathers up quite well and cleanses the skin without drying it out whatsoever. This shower oil is a real miracle worker if you suffer from eczema or psoriasis. It deeply nourishes those dry & irritated patches to reveal calmer, softer skin post-wash. I also love using this to shave with. It gives just the right amount of slip & helps me to get a closer shave around trickier areas like my knees. It is an expensive shower product but a little goes a very long way with this stuff. Each bottle lasts months & months for me so it's a worthy investment. I always hear plenty of praise for the Nivea In-Shower Body Moisturisers. Nivea make several different versions of this product but I was sent the sea minerals one for normal skin. Unlike the L'Occitane one this product is only meant to condition the skin so you still have to use a shower gel or scrub beforehand. When you're done with everything else in the shower you simply massage some of this all over your body then rinse it off. The formula absorbs instantly so you're left with lovely soft skin after drying and get can get on with getting dressed right away. Although it isn't quite as luxurious as the other products it definitely does help to rehydrate any dry areas & smooth my skin. It's a brilliant budget buy that works surprisingly well. The sea minerals one doesn't smell that great though so I really want to try the pampering honey, nourishing cocoa & almond oil versions. Having used up my tub of Ro's Argan Body Conditioner I decided to try out another Lush skin conditioner. After having my arm washed with several products instore (anyone else find this totally awkward?!) I decided to plump for African Paradise. At the time I didn't realise it but this product is actually pricier than the L'Occitane offering! This is a really indulgent treat for the skin. African Paradise combines loads of nourishing oils together including almond oil, moringa oil & marula oil with shea butter and cocoa butter plus a healthy dose of fresh mango juice. The resulting concoction is truly divine! The tropical scent is absolutely incredible & it stays on your skin all day long. I find it hard to stop sniffing myself whenever I use it. This is definitely the most hydrating skin conditioner. Nothing makes my skin feel softer. After washing it off my skin feels exactly the same as if I'd applied a regular body moisturiser but without any greasiness, stickiness or waiting around for it to absorb properly. It also features aloe vera to cool & soothe the skin which means that it can be used to treat irritation & sunburn as well. This is such a wonderful product & if you're desperately in need of some in-shower pampering then it's worth every single penny. I think for the price, the Nivea ones are hard to beat, I personally really love them! All of these look really awesome, can't wait to give one of them a try! I've always wanted to splash out on the L'Occitane one; smells sooooo good! 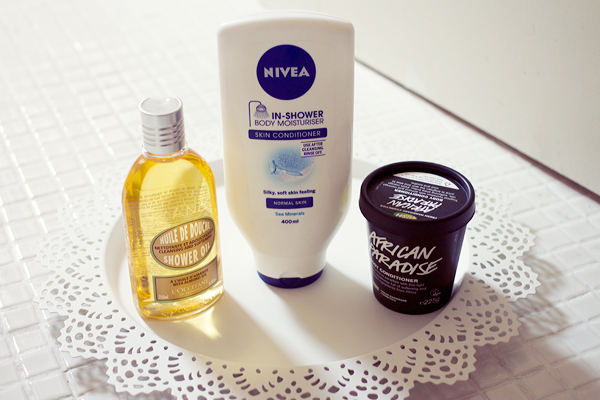 I love Nivea's in-shower moisturiser! I need to get my hands on one of these, I'm so lazy when it comes to moisturising my body! I think when my Soap & Glory shower gel runs out (I have that massive bottle from the xmas sets!) I will give the nivea one a go! I absolutely love Nivea & Lush so much! I have to try the L'Occitane shower oil now! Great post thank you for sharing!